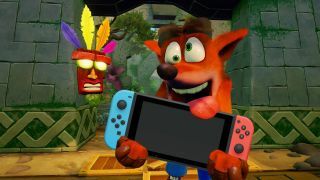 Crash Bandicoot N. Sane Trilogy is headed to Nintendo Switch and PC this year, according to a manager at a major UK licensing firm. GB eye's Max Arguile is quoted in the spring 2018 Licensing Source Book Europe (via ResetEra), saying the updated trilogy of 3D platformers will 'go broader' this year with ports for both platforms (and marketing to match) as well as another Crash game coming in 2019. The N. Sane Trilogy came out exclusively on PlayStation 4 last year, a fitting tribute to Crash Bandicoot's roots as an early PlayStation mascot. However, the character and franchise is owned by Activision rather than Sony, and Crash games have appeared on multiple console families ever since The Wrath of Cortex hit Xbox and GameCube in 2002. The N. Sane Trilogy was a big sales success on PS4 so Activision could understandably want to keep the ball rolling on more platforms. We don't know anything about that other Crash game Arguile mentioned for 2019; though he did say that "Activision has a five-year plan" for the Crash Bandicoot franchise. Maybe the next one will be an expanded and blown-out Crash Team Racing reboot? It's been too long since Mario had some healthy competition on the go-kart track - alternative karting fans can't live on Sonic & All-Stars Racing Transformed forever. I should point out that Arguile didn't say anything about a potential Xbox One version of the N. Sane Trilogy, which goes against some rumors that surfaced last year. However, it's possible that Activision's plans have changed since then, or that Arguile simply hadn't heard about the Xbox One version. For now, it seems safe to assume that Crash Bandicoot N. Sane Trilogy won't remain a PS4 exclusive for too much longer.